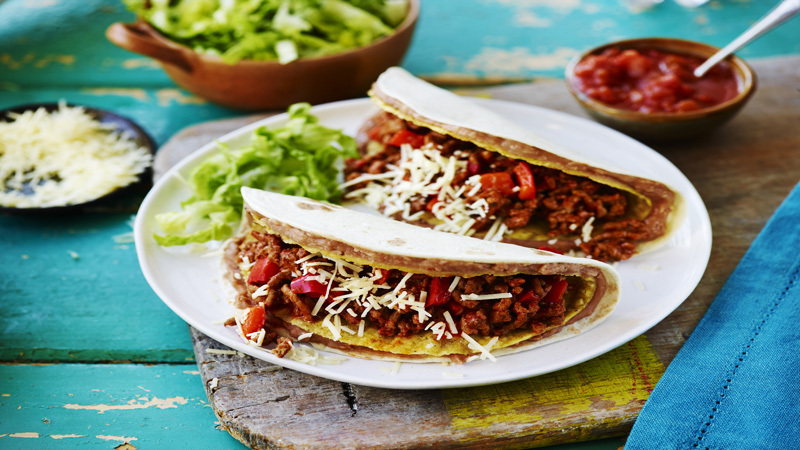 Layered taco shells and soft tortillas create the "double" with these filling beef and bean-stuffed tacos. Heat a large non-stick frying pan over a medium heat. Add the beef mince and cook for 5-7 minutes, stirring frequently until browned all over. Drain off any excess fat. Stir in the pepper, taco seasoning mix and water and cook for a further 10-15 minutes, stirring occasionally. 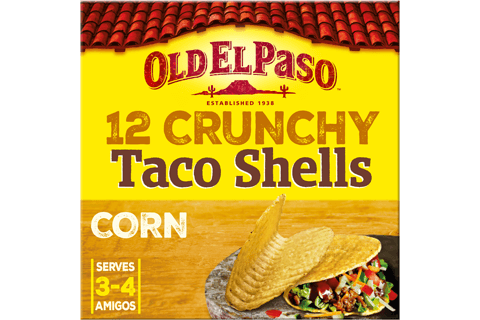 Heat the taco shells, flour tortillas and refried beans as directed on the packaging. Spread 2 tablespoons of refried beans onto each flour tortilla, then place a hard taco shell on the centre of each tortilla and gently fold the sides up to match the sides of each taco shell. Divide the beef mixture between the layered tacos and top with a little grated cheese. Serve immediately with the salsa and lettuce. For an alternative, replace the pepper with 75g of sliced button mushrooms or a drained tin of sweetcorn. Use the palms of your hands to gently press the soft flour tortilla to the sides of the hard taco shell and hold for a couple of seconds to secure.